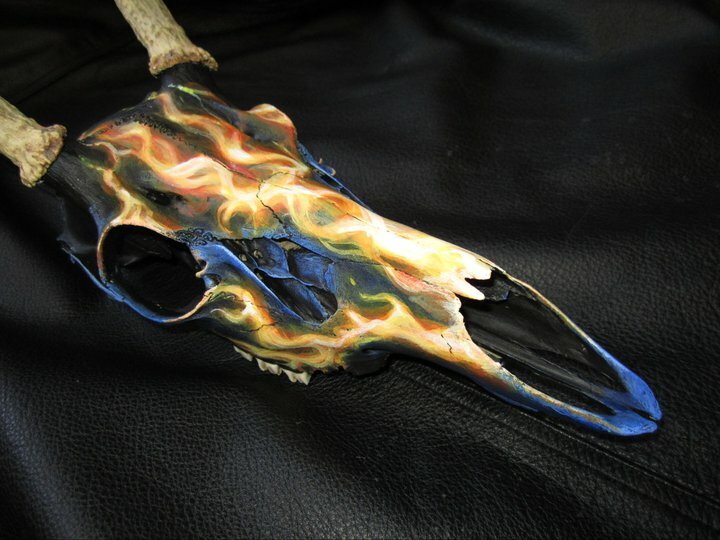 I do not sell skulls, I paint yours. 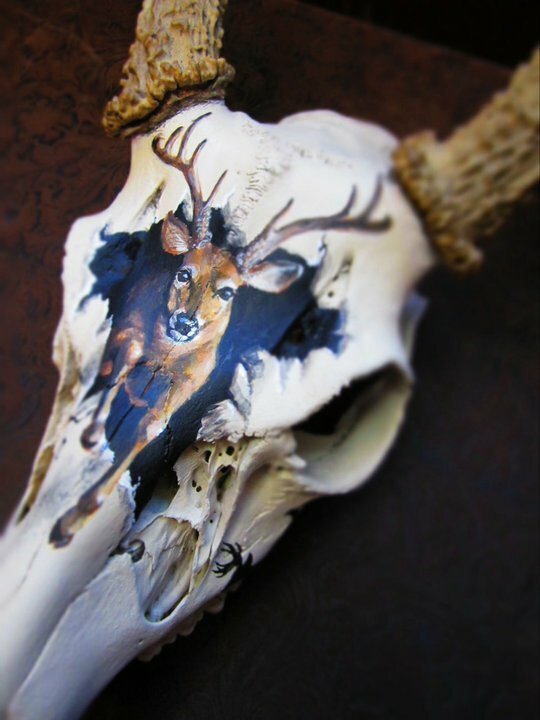 Any species is acceptable, as long as they are legally hunted or obtained, and clean. They need not be in good condition (weathered, cracked, broken pieces are not a problem), as they will be sealed with paint. 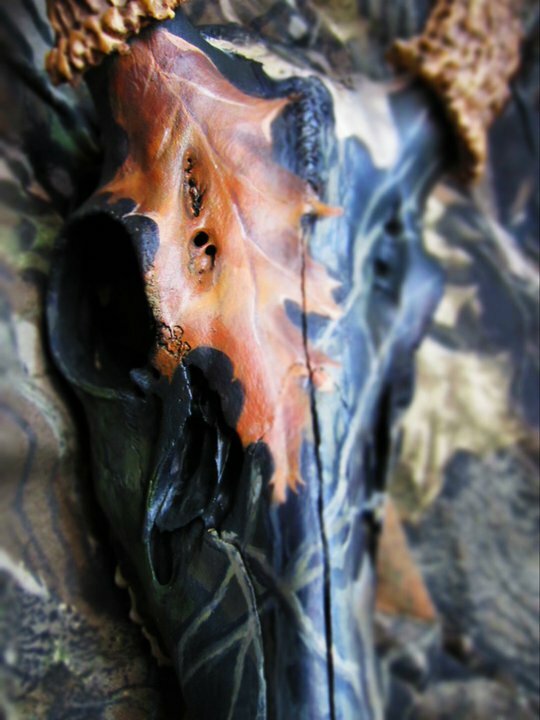 I am learning to do some reconstruction (see my first attempt under the "Camo" Skull at right), at an additional cost, feel free to ask about these services. 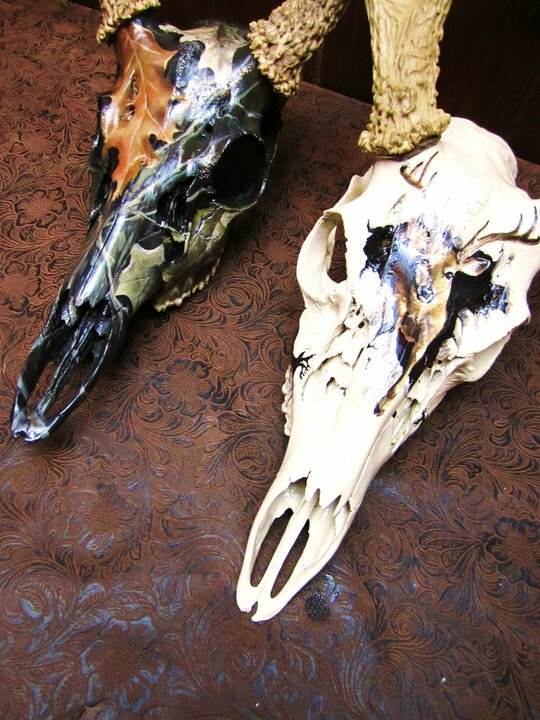 The skulls currently shown at right are around $250 for full skull paint (paint covering entire skull- "Buster" is painted all over with bone-colored paint to improve the overall appearance), depending on the complexity of design. Shipping can be problematic, not only because of the potential for breakage, but also because many, if not all, states do not allow transport of animal parts. 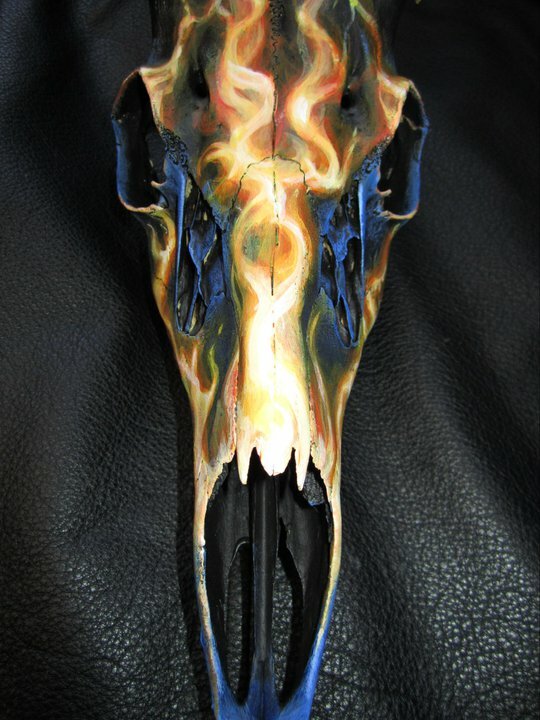 There are other options, if you don't have someone local enough to you to paint for you. 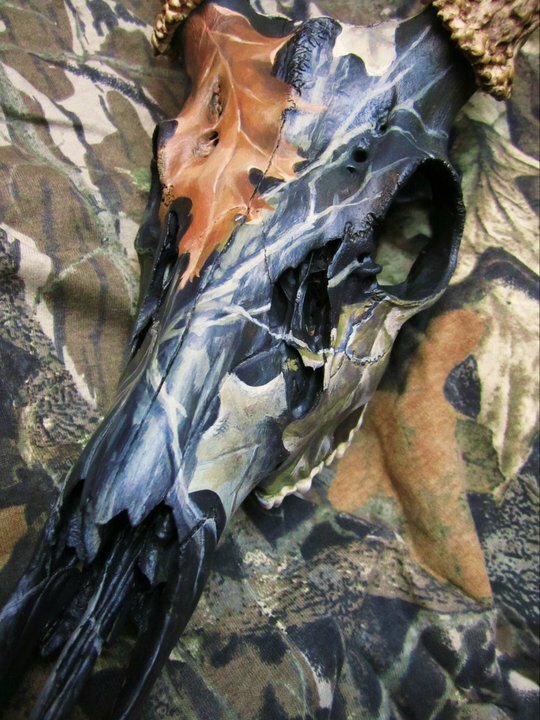 There are skull replicas made from resin or plastic that I am happy to paint and ship to you, and then you get your antlers (when applicable) mounted to the replica. 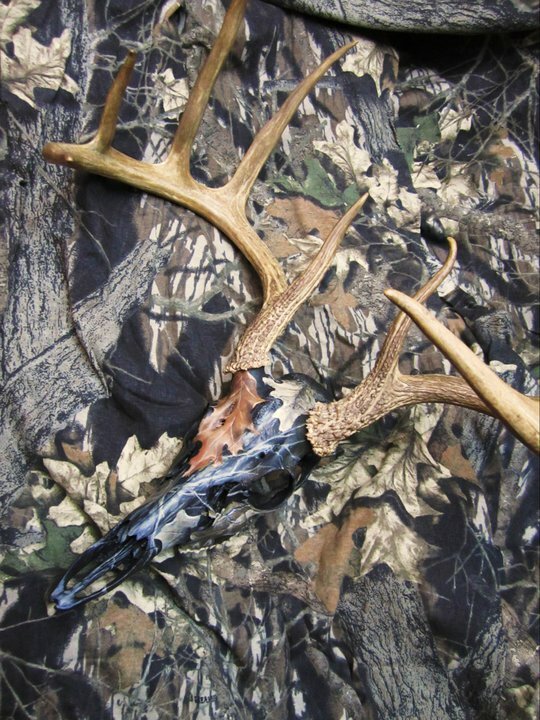 Costs vary depending on the price of the replica, feel free to ask about this option. 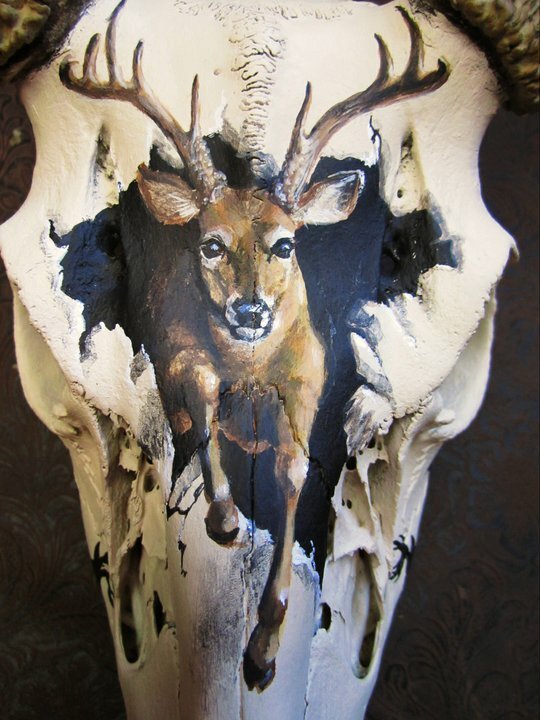 I will paint your authentic (European Mounts or unmounted clean skulls) OR replica skulls, with a custom design that you and I work on together. 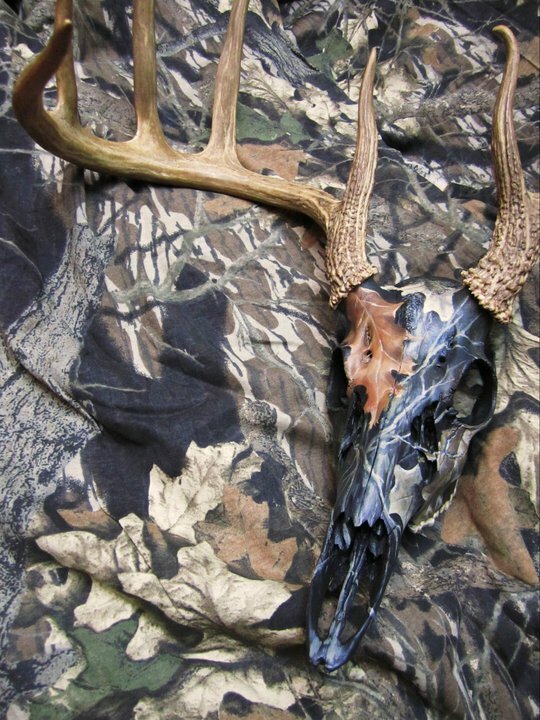 The possibilities are endless- camouflage (see below), an image of the deer itself (see below), the date and place of your hunt, or a tribal design are some common themes. 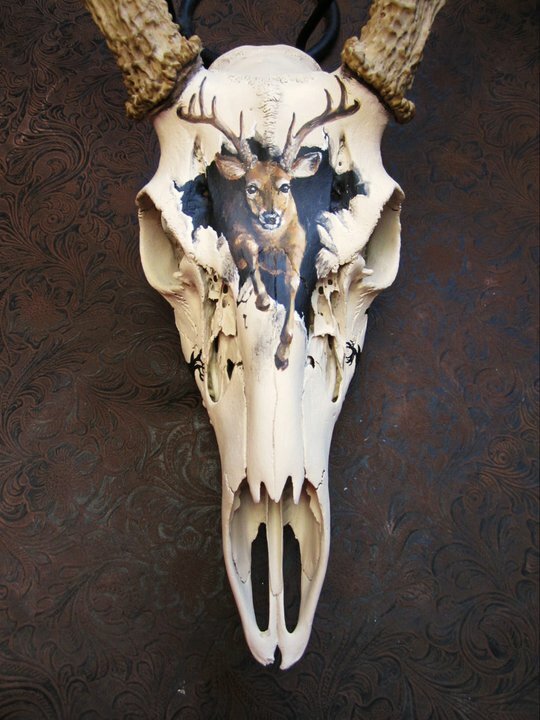 If you have seen a skull painted with something you like, I will be happy to create something similar just for you; however, no two skulls will EVER be the same. 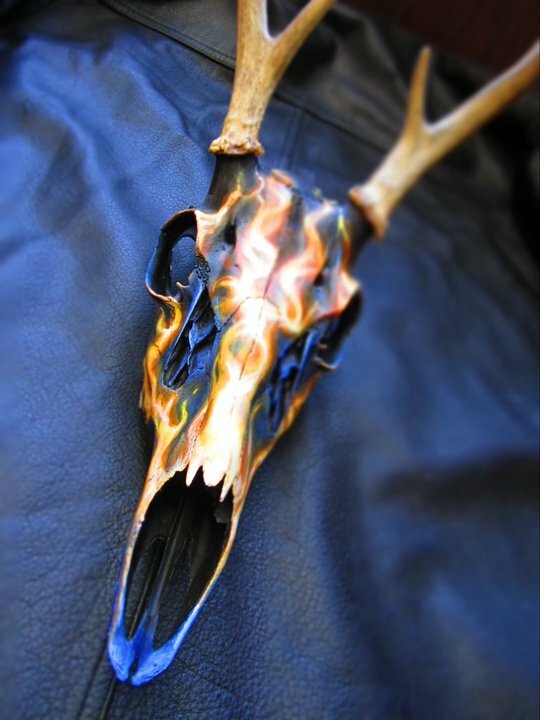 This treatment is an affordable, unique and different way to display! 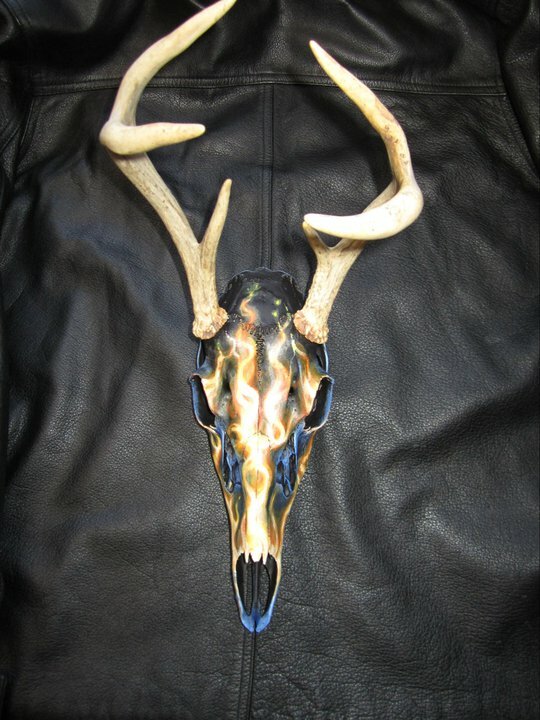 Here are two I did for a friend. 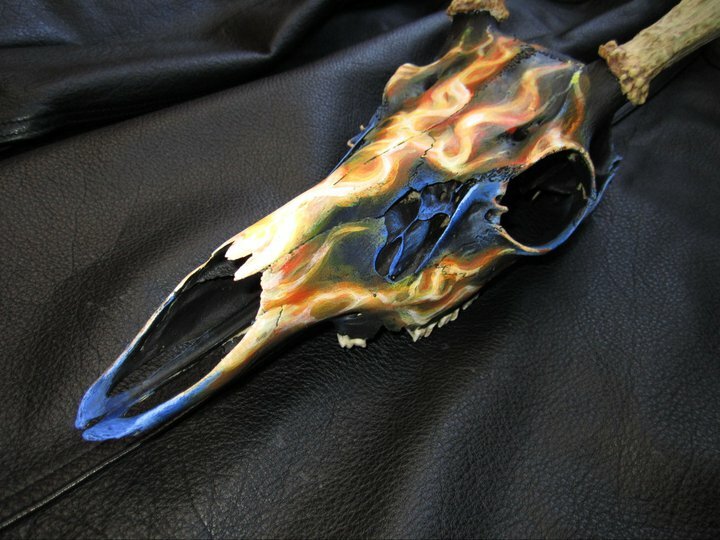 Took me a while to work up the courage to paint on such nice skulls, but thanks to hubby letting me practice on his, I am gaining confidence. Both of these were coated with a glossy clearcoat after I took the detail photos below (details on a glossy surface don't photograph well). I call this one "Buster" (Busting Through). 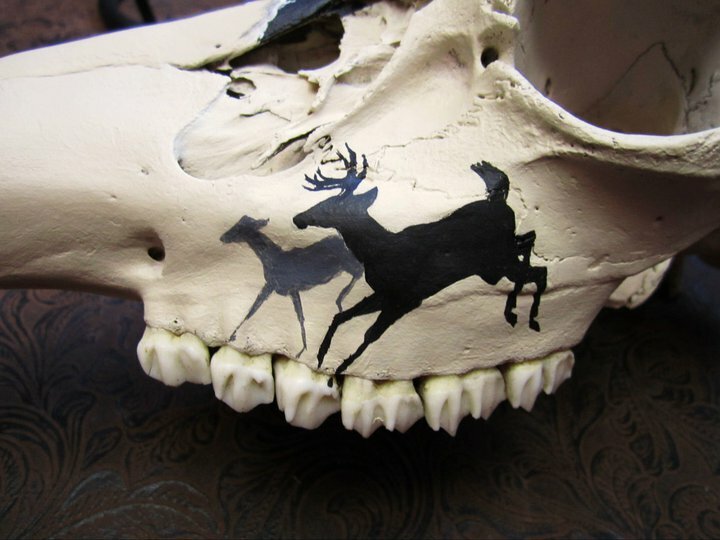 The deer's rack is of course based on the actual rack on the skull. 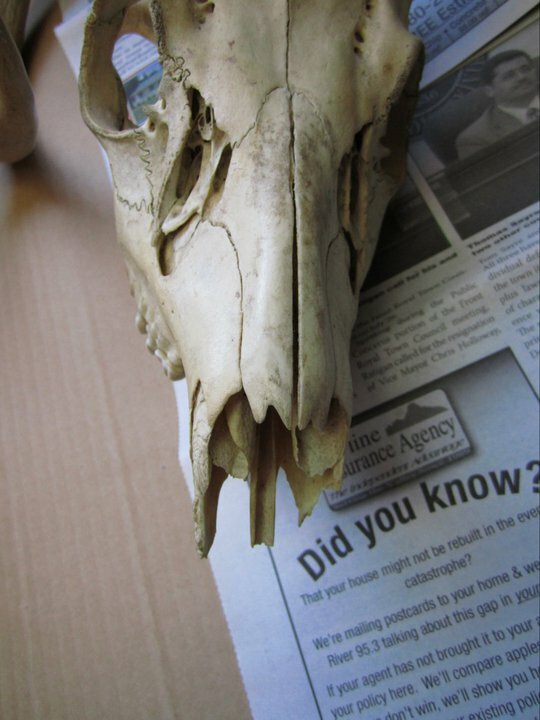 The entire skull is painted with a bone-colored paint to smooth things out, as the skull was weathered and cracked. 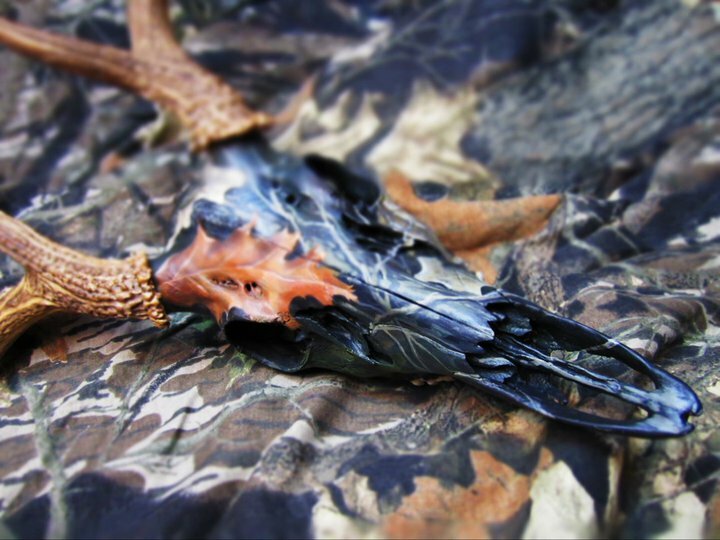 The second one, "Camo," is done with a teeny bit of a camouflage influence- Mossy Oak to be exact. 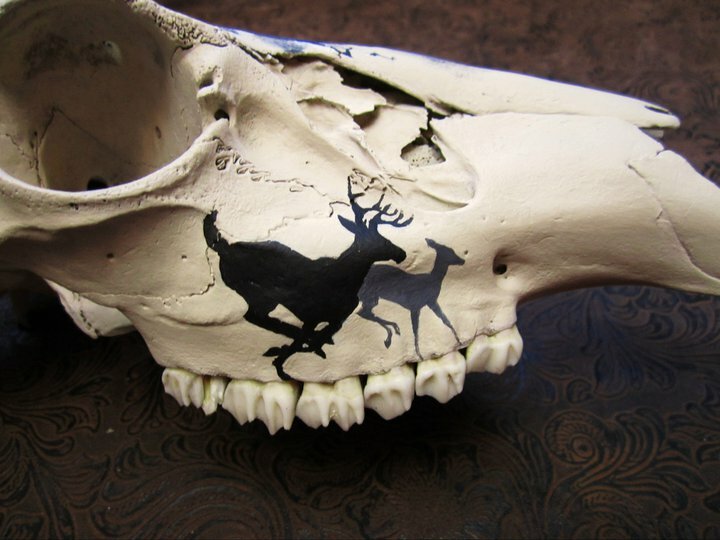 Just a little ;) I wanted one leaf to be realistic, so it would look almost as if it were sitting on the skull. 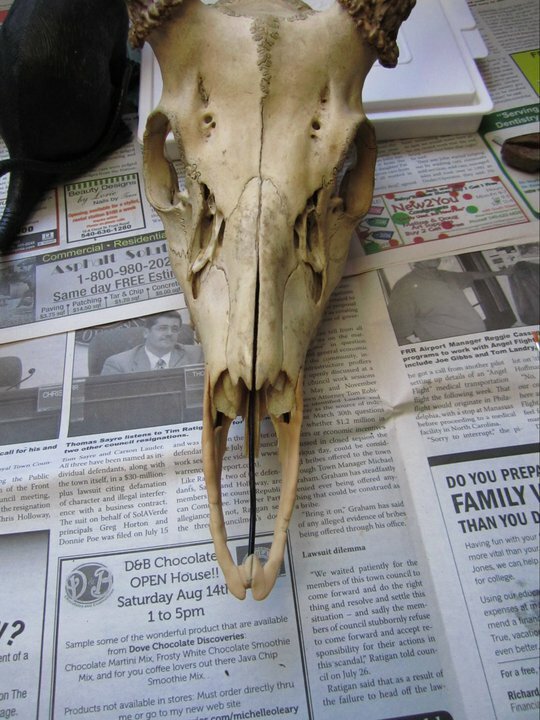 The Camo Skull had a broken nose when I received it, and I wanted to try my hand at reconstructing it. I used wire for a framework and then applied Sculpey clay over it. And of course, complete. Not perfect, but not bad for my first try.